Applying the concepts of 5S is usually one of the first steps companies take in implementing Lean Manufacturing. 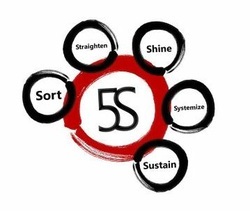 The 5S’s (Sort, Set in Order, Shine, Standardize, and Sustain) are rough translations from the original Japanese terms referencing a process to optimize workplace organization. The key benefit of 5S is removing motion waste, one of the 8 wastes of Lean. Workplace organization is considered a foundational tool in Lean and must be applied to the organization before other more complex tools can be implemented. 5S is best taught in a learn / do setting where participants learn a specific concept in the classroom and then apply that particular concept directly to the workplace. Depending upon the size of the workplace, events can run anywhere from one day to five days in length. 5S overview training is also available and beneficial for new employees as part of employee orientation. Overview training is typically completed in one to four hour sessions dependent upon the level of training detail desired.